1. Heat oil in a large skillet over medium-high heat. Add 2 tablespoons onion and garlic; cook 1 minute, stirring constantly. Cool slightly. Combine onion mixture, breadcrumbs, and mint; add lamb, beef, 1/2 teaspoon salt, 1/4 teaspoon pepper, and egg; stir gently. 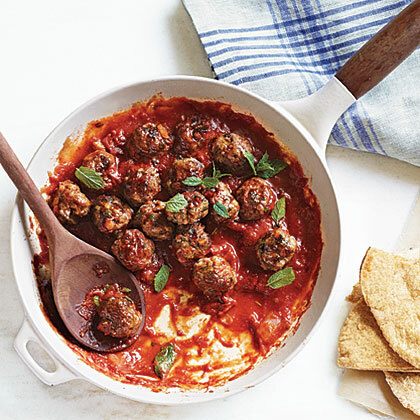 Shape into 30 (1-inch) meatballs. 2. Return pan to medium-high; add meatballs. Cook 4 minutes. Remove meatballs from pan. Add 1/2 cup onion to pan; sauté 2 minutes. Add ginger and next 3 ingredients; simmer 5 minutes. Stir in 1/4 cup water, 1/2 teaspoon salt, and 1/4 teaspoon pepper. Return meatballs to pan; simmer 20 minutes or until done. Serve with pitas. Sprinkle with mint leaves.